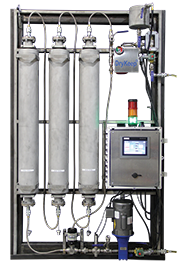 The DryKeep® SMART (SCADA Monitoring Analysis and Reporting Technology) design includes permanently installed moisture-in-oil sensors and a PLC-based monitoring and control system. The dry-out process is monitored and regulated continuously to ensure proper results. The operator interface (HMI) displays the estimated percentage of moisture in the paper, incoming and outgoing moisture-in-oil in parts per million, oil temperature, system status and alarms, pump operation, and flow integrity. Read more.